Wow! I was just outside walking the dogs. It's 30 degrees! Very crisp! I LOVE it! It will drop to 25 by morning. Then we have rain forecasted for Saturday and Sunday with highs of 68 and 74 and lows of 50 & 62. Do ya think we'll get sick??? Crazy weather!!! 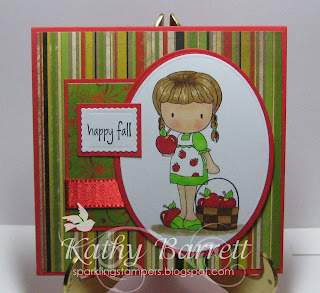 I've got a fall card to share tonight to go along with the weather! This is a CC Designs Sugar Plum image. I just love all those apples! She's colored with Copics (my E31 died as I was coloring her hair). The dp is Bo Bunny and cs is DCWV. Sentiment is also from CC Designs. Ribbon is from HL. I used nesties to cut out the image and sentiment. The sketch comes from Tip Top Tuesday. LOve this design and the way you put the colors for you. VERY cute card! Fantastic interpretation of our Borrowed Sketch at Top Tip Tuesday. I love it! Remember you can enter up to 3 projects and 3 tips, good luck!